There’s always a point in the herbal year where I realise that everything is growing, blooming and fading so quickly and I have not been organised enough to make all the medicines I have planned. With all the delightful warm weather this spring it’s got to that point earlier than ever before! Seeing my first nettles in flower gave me a shock this week, I have made some nice tinctures but haven’t dried even a single plant yet. 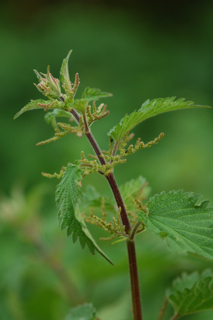 As many of you probably know, nettles are said to become irritating to the kidneys after flowering due to the presence of cystoliths. I managed to dash out on May day weekend to collect elder leaves for making infused oil and salves before the flowers burst fully into bloom this week. If you live further north and your elders aren’t quite flowering yet then it’s not too late to make some elder leaf infused oil which is great as an all purpose healing salve for rubbing onto bumps, bruises, bites, minor wounds and chilblains. 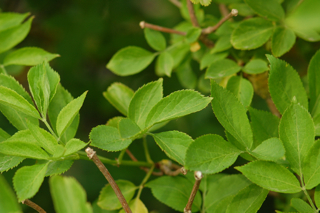 David Hoffman writes, “some reports hold that elder leaf may be effective as an ointment for tumours” which is particularly interesting and Gabrielle Hatfield states that it was used as an insect repellent as well as a treatment for bites. Both these uses were new to me so I look forward to trying them out. I made this oil by covering the fresh leaves in olive oil in an ovenproof pan, putting the lid on and letting it macerate in the oven on the lowest heat for three hours. I usually infuse my leaves using the double boiler method which I wrote about here but this new dish lets too much steam in which risks ruining the oil so I opted for the oven method instead. 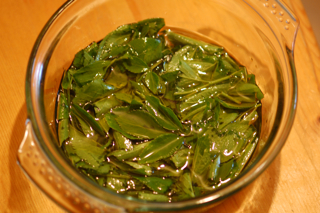 The oil came out a delightful deep, dark green and feels full of healing virtues. 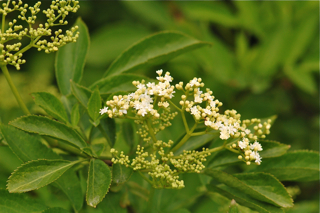 Several herbalists recommend using vaseline as a base to infuse elder leaves and elder flowers. I would recommend staying away from petroleum based oils and jellies as they prevent the skin from breathing, a vital function where healing is needed. Energetically speaking the leaves are best harvested before flowering as the plants put their momentum into the blooms after this point. I’m not sure if anyone has measured the difference in chemical constituents but it makes sense to me that this would be so. I was just in time as all the local Elder’s have begun flowering now. Which means that along with the Wild Roses that are newly decorating the hedgerows there’s even more medicine making to be getting on with. A herbalists work is never done! Lucinda you have reminded when in the UK I made a great green ointment for bruises, swelling etc of all kinds from Elder leaves, ground ivy, plantain & wormwood. Indeed it worked wonders on one of my patients who had a Baker’s cyst. If I recall the recipe is in Mrs Grieve’s herbal. It sounds wonderful. I’d love to try it though I personally would stick to the olive oil rather than lard being veggie. Thanks for the tip re bakers cyst, very useful. Yes you want to strain out all the materials so you’re just left with a clear dark green oil. I usually strain through a square of muslin cloth or, if there are very fine particles, an unbleached coffee filter works well. I’m glad to hear that I’m not alone in my anxiety of keeping pace with the quickness of spring. Everything happens so fast, it seems that the leaves have all appeared in a blink of the eye here and there is the sense that if one looks away for only a minute, they will miss something! I remember reading about elder leaves in Hoffman at some point, but I have never gotten around to trying them out. As they still have a ways to go before flowering here, I think I’ll get right on it and try making some oil too. It seems like a wonderfully handy thing to have around! Yes do try it and we can compare notes. What have you been using your Elder salve for? Elder is a joy to follow through the seasons isn’t she, I’m looking forward to my first elderflower harvest this week.